The Maine Department of Transportation plans to put strips along the road’s center line this summer after crash deaths and head-on collisions. 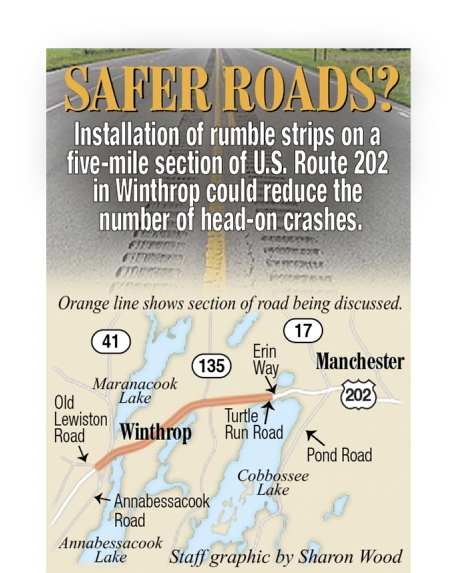 WINTHROP — State officials’ plan to lay down center-line rumble strips along a dangerous, five-mile stretch of U.S. Route 202 through town this summer got support from residents at a Tuesday night meeting. But discussion led to general complaints of fast and distracted driving on the road, the main corridor between Lewiston and Augusta that reaches speeds up to 55 mph, and suggestions for state officials to do more to slow traffic down, including adding turning lanes, reconsidering speed limits and more. The Maine Department of Transportation says its plan would likely cut the number of head-on crashes on the road in half. Those types of crashes have resulted in the bulk of deaths on the stretch of road through town since 2003. In Winthrop alone, there have been seven crash deaths on U.S. 202 since 2003 between the Manchester line and the intersection with Annabessacook and Old Lewiston roads, four of which came after head-on collisions, according to department figures and Kennebec Journal archives. John Dovinsky, chief of Winthrop’s ambulance service, said he has worked on a lot of main roads in his career in southern Maine, and U.S. 202 is the most dangerous for accidents because of speed, traffic volumes and other factors. “I have been at every one of the fatal accidents out there over the past decade, and I can tell you it’s been very unfortunate,” he said. Under the department’s plan, rumble strips would be installed this summer in Winthrop, likely in an area just west of the Manchester line to the intersection of Old Lewiston Road and Annabessacook Road, with some gaps planned, especially near intersections, businesses and homes. It will cost an estimated $34,000 to install the strips in Winthrop, which make noise and cause vibrations when crossed by a vehicle to warn potentially inattentive drivers. The department is also planning to add strips on U.S. 202 in Lebanon this summer. Already, there are eight stretches of road with center-line rumble strips in Maine: Route 4 in Turner and Route 1 in Woolwich were the first to get them in 2006 and more were added in Hancock and York counties by 2013. The results have been stark on the Turner and Woolwich stretches: In the six years before the strips were installed on the stretches of road, there were 21 head-on crashes and eight deaths. In the six years after, there were 10 head-on crashes there. None were fatal, and Duane Brunell, safety manager for the transportation department, said there have been no crash deaths on any of the roads where center-line strips have gone in. Transportation officials have considered putting rumble strips through Winthrop since at least 2012, when the department got approval from the town to do it. The plan initially would have included strips on both sides of the road, but it was shelved amid concerns about noise. The Winthrop stretch has been particularly dangerous over the past few years. The most recent fatal crash there was in March, when 71-year-old Richard Leighton of Winthrop died after a vehicle driven by a town woman crossed the center line and hit his truck head-on. There was another fatal crash on the road that month in Monmouth, in an area that wouldn’t be affected under the rumble-strip plan, but Smith said the department will be considering installing strips there in the near future. Between 2003 and 2013, there were 28 head-on or near-head-on crashes and 28 serious injuries total on U.S. 202 through Winthrop, with more this year. Another 79 crashes occurred after vehicles left the road. None were fatal, but they resulted in eight serious injuries. When discussion turned to questions from residents, officials were confronted with requests for state officials to do more. Shawn Smith, a department project manager, called rumble strips “a first step” that could lead to future fine-tuning and more drastic measures should problem spots pop up.